You'd need to be mad to start a new business in times such as these. Not being mad would be good. Being nomadic might help. Itinerant, if you will. Of no fixed abode, if you must. Which is why you may already have encountered these fine folk in Woodbridge market or outside UCS opposite Loch Fyne or as far afield as Bury St Edmunds. They move around, see. Keep you guessing. Until now, that is, when Snobs have landed some temporary accommodation in the dead centre of IP1. 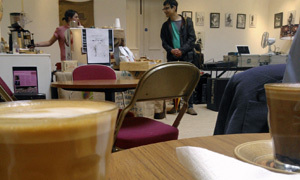 In connection with Switch Fringe -- running in the underbelly of Ip-art -- their pop-up cafe has popped up in the delightful Town Hall galleries. Yep, straight up the steps, straight through the doors and straight ahead into gallery 1. There's often some of that there art in here, but now you can relax on a sofa and take some refreshment. What a good idea. When myself and Andy stopped by, there were no savoury goodies to be had. OK if we bring in something from the market? No problem, said Abby and Steph, the Snobs Sorority. Which we then did, before getting down to the main business of the day: coffee. My latte looked leafy and tasted terrific. And the custard tart on the side was what Del Boy might call the piece de renaissance. Got your art on the walls, got your arty books to peruse, got your light, and you've now got your jolt too. There's more fliers in here than a Howard Hawks flick. As my boss is fond of saying, there's a lot going on. Who knows how long the baristas will be brewing up in here? Current hours are 10am to 5pm, so get yourself down there and support a truly independent local business. Perfick for the culture vulture. If they were passing by -- Mary Blake.